Brazilian President Dilma Rousseff pledged Thursday to continue focus on “economic solidarity” while nominating new members of the economic team for her second presidential term starting from January 2015. “We will continue prioritizing social inclusion, employment, access to education, security and political and economic stability, investment in infrastructure and modernization of the country and the increase in income of the people,” said Rousseff on Thursday. 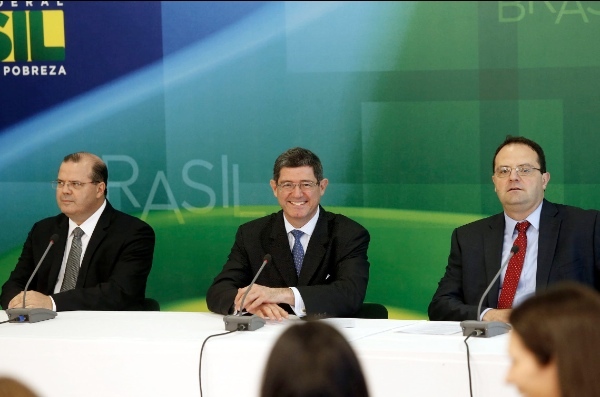 Rousseff has named Joaquim Levy as Brazil’s new finance minister, replacing Guido Mantega. Levy was in charge of asset management at Brazil’s Bradesco Bank, and had served as treasury secretary of former President Lula da Silva and as chief economist of the Planning Ministry in the administration of ex-President Fernando Henrique Cardoso. Economic data due to be released on Friday is expected to reveal Brazil’s GDP grew by a seasonally adjusted 0.3 per cent from July through September from the previous three months, avoiding a recession. Rousseff on Thursday also announced a new Minister of Planning, Budget and Management- Nelson Barbosa, who is a economics professor, and had worked as Mantega’s executive secretary and as Lula’s economic policy secretary. Alexandre Tombini, who has served as central bank president since the beginning of the Rousseff administration in January 2011, will stay on. At a press conference following the announcement, “Levy promised a smooth transition in the government’s economic policy,” the state-run Agencia Brasil reported. Rousseff won a second four-year mandate in October’s general elections. Election data showed that most of Rousseff’s votes came from the poorer north and northeast, where social programs begun by former-President Lula and continued by Rousseff, both of the Workers’ Party (PT), have lifted millions from poverty.